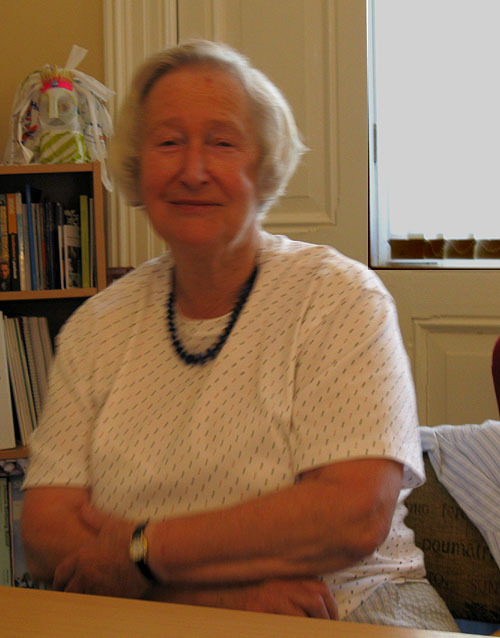 Janet Heady (née Butler) was a pupil at the Latin during the War years and was Head Girl in 1950. Her father worked at the International (grocery) Stores in town on a site that has been absorbed into The White Hart. Janet met Peter Heady at our school and they subsequently married. Peter Heady was a lifelong cricket fanatic and his grounding ensured that the their son, John, became a good leg-break bowler, number 7 bat and useful close fielder who was an important member of the RLS 1st XI when Ed Grimsdale was in charge. John Heady was a Boarder at Brookfield and many of summer evenings after “Prep” were spent in the RLS cricket nets that languish almost forgotten behind the New Block. The Headys (senior) were near contemporaries of Edna Robinson and her sister, Jean, who were evacuated to North Bucks during WWII from London. After the War, Janet remembers Edna going out with Vernon Taylor. However, in due course, her sister Jean married Vernon, and Edna, who had become a teacher at Well Street School married the Headmaster of our school, George Embleton (on St George’s Day!). Janet Butler married Peter Heady in 1955. Peter was the RLS Victor Ludorum in 1948 and our Cricket Captain. He read History at the University of Cambridge and then took a one year course in Russian as part of his National Service. Because Peter joined the Colonial Service ( do you remember that? ), the two of them spent many years working abroad but they always kept in touch with the school and with Edna & George. On one occasion when the Headys were based in the Seychelles Islands, they came to Britain for a break whilst the Embletons toured the Seychelles in the Headys car. Peter Heady was awarded the M.B.E. for his service to our country. Sadly, Peter Heady passed away a few years ago. Janet remains very active in Helmdon just over the Northants border, whilst John, now married and with a family, lives and works in Winchester. It was good to welcome Janet back to school for Founders’ Day 2009 where she read that favourite lesson from the Book of Ecclesiasticus “Let Us Now Praise Famous Men”. Janet Heady told Ed Grimsdale that she remained in touch with Susan Toft , the daughter of the Head of our school whose service was interrupted by World War II. Thanks to Janet’s kindness and organisation Ed & Andy were able to meet the two Toft sisters and their families at school just before the end of term. Look elsewhere on this site and you’ll find the evidence. Janet also spoke of Derek Lillistone, her near contempory. Derek went on to Sydney Sussex College at the University of Cambridge where he gained a blue in the High Jump. Janet and Derek are still in touch.